St Aubyn. – Dirty wet dog , boats and sailing. I have no idea who the original saint was and care less but the harbour and anchorage named for him is pretty good. Although i have sailed around the English channel for years and been to most of the islands i have only ever got to Jersey on delivery trips so towards the end of our France trip last year came back from Paimpol via Jersey and guernsey. The main port in Jersey is commercial and very busy with ferry’s and coasting ships in and out during the night so not very restful but just over the bay from St Peter port is the small drying harbour of St Aubyn. St Helier is fine for getting the shopping done, bit of a pain to find petrol for the outboard in the town but not somewhere i would want to spend any time though. It was a bit of a rush to get across there on a falling tide : man are those channel islands spring tides fast moving ! and we couldn’t get into the drying harbour and only just glided in to the beach with the boards up and the outboard just puttering away. 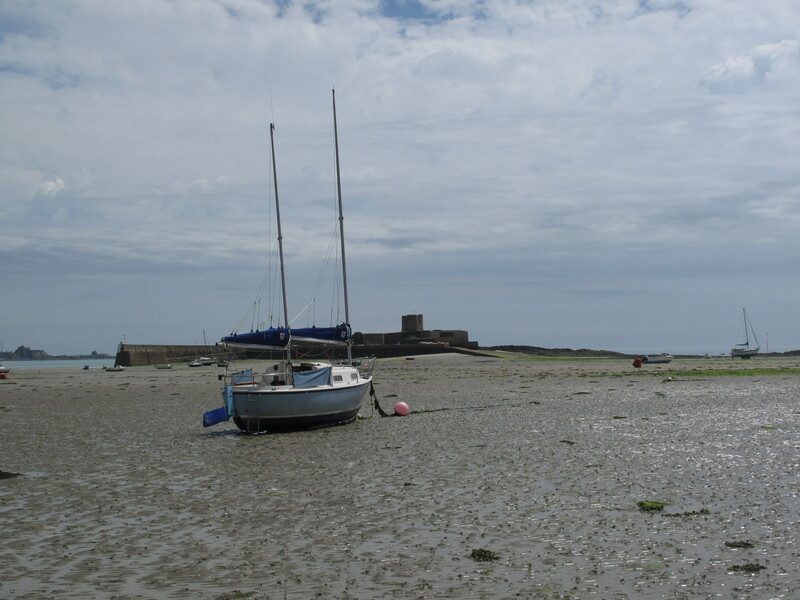 I picked up a convenient mooring and within minutes we were aground on firm sand so i went ‘walkies’. The anchorage near the harbour entrance is good hard sand but the harbour itself is thick gloopy mud apart from the most shallow part up against the landward wall and we would never have got in there and neither would we have found a space so we were quite content with walking ashore on the sand. In retrospect i would bypass St Helier and just come straight to the anchorage here : the only real problem is that a bit of swell comes in with the tide so the boat bumps on the bottom for a while but the town itself is fine for food and shopping and the chandlery is as good as anything across the bay. Later in the day after lunch ashore i walked right out almost to the fort in the bay. This is the place where i met the bloke with the Poacher cat ketch : as i said in an earlier blog that was one boat that i almost bought locally as a ‘fixer-upper’ for my trip : smaller overall and poky inside they look as though they might be a better all round sailing boat with a heavy drop keep rather than the Liberty’s internal ballast and a hull shape reminiscent of an IOR mini-tonner….that concept has given me an idea for the boat ‘beyond WABI”’………Later. Let me know if i can help you with anything . I know the channel islands fairly well as a sailor having raced in the channel for many years. It might be worth having a quick read of ‘brehat’ here and ‘paimpol’ as they are close by on the French coast as well. I should post about a bay just down the coast from St Aubyn (st brelades) bit haven’t got decent photographs !